Cleveland Curiosities is an antiques and oddities shop located on Madison Avenue. The shop was opened by Clement Kunkle and Hallie Wallace in August. Taxidermy animal heads, skeletons, antique medical equipment, odd artwork and more can be seen around the shop. The owners pride themselves on having strange authentic pieces–ones that you would not see in a museum. They have collected elements from many different cultures and tribes. Kunkle and Wallace have worked hard to form good relationships with oddity vendors around the world to open up their market. They will always try their hardest to hunt down specific things a customer is searching for. 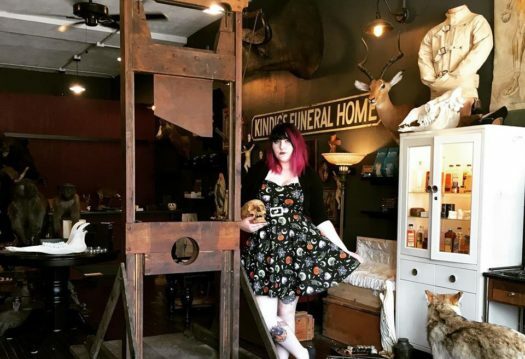 Kunkle has been a part of the world of oddities for around eight years, and has become known for his taxidermy and supplies. Television shows that focus on oddities (such as My Friend Dahmer and American Horror Story) have come to Kunkle for his pieces. With taxidermy being one of their main features, some might question how they come to possess the animals that are displayed. Don’t worry though, according to Kunkle, all of the taxidermy is ethically sourced. They work with a taxidermist in South Africa to legally import everything. They also are supplied by different zoos across the United States. Wallace describes their shop as, “a lot different from a lot of the usual ‘dark’ shops in town, and it’s also really educational.” The shop also offers custom classes, such as a two-day bat and etymology pinning class.